Bottom line: As far as I can tell, CyberLink PowerDirector 12 is by far and away the best of the consumer video editing suites. By consumer I mean you won’t use this to edit a feature-length film, but it’s still pretty sophisticated. At the same time, a novice will find it intuitive and easy to use. My website is full of videos, mostly related to ham radio or motorcycling. I’ve tried different methods for making them, and after considerable frustration with Roxio VideoWave’s lack of stability, I converted to CyberLink PowerDirector (PDR). As it turned out, my HP PC already had a free starter version of CyberLink PowerDirector, which I tried and found to be far more stable than the Roxio software I’d paid for. So I ordered PDR version 9 from CyberLink, which I found to be easy to use and—important to me—far more stable than the Roxio software (keep in mind this is a couple years ago—Roxio may have improved). I enjoyed the clean PDR interface for trimming and joining video segments, adding royalty-free music from SmartSound, and creating titles. And it even autosaves the project periodically, something Roxio didn’t do back then. A word about the various PowerDirector Version 12 editions. Each builds on the previous. Let me translate their marketing language for you. Prices are web download editions as of today. Ultimate Suite The same as the Ultimate, plus two new features that are pretty much programs in their own right: ColorDirector, which allows all sorts of color grading, fixing, and generally massaging your video, and AudioDirector, which provides tools for massaging your audio. Both are integrated into PDR—when you want to use either of them, clicking in the right place takes you to the auxiliary program, then when you’re done you can go right back to where you left off. ColorDirector is better integrated than AudioDirector. $199.99—note the big price jump. You can read CyberLink’s comparision by clicking here. You can see what the full feature set is by reading their website. I haven’t used all the features, so this is a review of those I have. A couple words: video editing requires a relatively powerful desktop or laptop. My desktop is several years old, and even though it sports an NVIDIA graphics card, which PDR uses to accelerate processing, my new Toshiba laptop beats it hands down. I now do all my editing and rendering on the laptop. CyberLink natively supports 64-bit processing. A word to the wise: the CyberLink code is huge. When I downloaded the Ultimate version of PDR 12, the files added up to six gigabytes. If that’s too big a download for you, you can order a disc (they call it a CD, but it’s a couple of DVDs) for an extra $15 plus shipping. Oh, and beware that your video collection will grow quickly, and video files are large. I’ve found that a day’s motorcycle ride worth of GoPro Hero 2 video can be as much as 16 GB. You can very quickly fill up a 1 TB hard drive. A suggestion is to use an external drive to hold your video clips. Also, PDR 12 allows you to “pack” the project into a single directory that contains all the files actually used to create the video, so you can go back and edit the project again. I like to copy these packed directories to data DVDs (sometimes having to use the bigger and more expensive 8 GB double-layer DVDs to contain all the clips and the rendered video). I also store a copy of the packed project onto a network hard drive, and then I clean my laptop of all the video and project files to manage my disk space back. BEWARE that when PD packs your project, it does NOT include the rendered output file, so you’ll need to copy this separately. It’s intuitive. You can use it at a novice level up to an expert level, and it doesn’t force you to know a lot to use it as a novice. You can do simple slideshows set to music easily and quickly. You can add titles easily. It’s stable. This is very important to me. The ham radio training videos I create take literally hours in the editing seat, and having the program crash just as you add that final cool feature is extraordinarily aggravating. Caveat: It’s stable on my Windows 7 desktop and my Windows 8.1 laptop. I obviously can’t say how stable it’ll be on your machine, but I don’t see complaints on the web about stability issues. It autosaves your project at user-selectable intervals. The default is that the autosave feature is ON, which is exactly as it should be. It grows with you. If you want to use additional features you can—otherwise they stay silent in the background. The chroma key (green screen) capability is much improved. And, one of the included NewBlue plugins offers an even better chroma key capability. This is particularly important to me for the training videos I create. The editing screen allows you to layer video on video. You can add picture-in-picture effects, title overlays, and so on. It also makes it easy for me to sync up separately-recorded audio with the associated video clip. (It also has a multi-cam capability that I haven’t used yet.) The voice-over feature is straightforward. This may seem like a nit, but if you create PNG files that have transparent spaces in them, PDR 12 respects those. This can really be helpful here and there. PDR allows you to preview a clip, an effect, a sound, a transition, or whatever, before actually applying it to the timeline. You can burn a DVD directly without having to render first. It has lots of templates for DVD menus, which you can modify. Like nearly all software today, PDR is “lightly documented.” In other words, the 250+ page user’s manual that you can download and print only touches on each of the features. In many cases it doesn’t tell you how to use them, and certainly doesn’t say “be careful of this because….” The on-screen help system doesn’t add much more. The online tutorials are a good introduction to basic capabilities (and the novice will be grateful for them). Also, there are any number of YouTube tutorials, ranging from well done to, well, not well done, so sometimes a Google search on a particular feature will bring results. What I’d love to see CyberLink do is create a comprehensive on-line reference that customers can add to, like a moderated wiki or like the WordPress Codex. I really wish there was a way to truly keep everything about a project in a single directory. As it now stands, you can specify the input and output directories for media files, but that doesn’t mean that when you save the project (meaning save your edits) that the project PDS file will end up in the output directory. And, if you have to go to some other directory to get a clip, PDR automagically (and frustratingly) changes the default input directory to the other directory. The lack of this wished-for feature, probably more than anything else, drives me nuts, because I’m constantly trying to figure out where a file went. I dearly wish AudioDirector would allow me to save custom presets. I record the ham radio videos in a studio under controlled conditions. That means I need to do the identical audio processing to as many as ten or fifteen clips. I have to open each one, watch PDR switch to AD, select compression, set all the parameters, then switch back to PDR. What a pain! If I could save a preset, that would be a major step in the right direction. Even better, load that preset back into PDR so I can apply it to multiple audio clips the same way you can do with ColorDirector! I’m not sure Audio Director does anything more than Audacity, and Audacity is free and has more flexibility. Adding backgrounds and default clips requires some sleuthing to discover where PDR 12 puts them. To save you the trouble of finding them, here’s where they are. In Windows 7, 64-bit, it stores 16×9 backgrounds in this directory: C:\Program Files\CyberLink\PowerDirector12\Background\16_9. The sample clips that come up every time you open the program are in this directory: C:\Program Files\CyberLink\PowerDirector12\SampleClips. You can add your own content to these directories. Or take out what’s already there. The software will render your video and put it up on YouTube or Vimeo for you. Personally I prefer to render the video the way I want (H.264) and upload manually. PDR will not automatically upload videos longer than 15 minutes. You’ll need to do considerable experimentation to decide how you want PDR to render your video. I opt for H.264, 1080p at 24 frames/second (see an example by clicking here). This seems to be a good setting for the instructional videos. Unfortunately PDR’s rendering instructions are along the lines of “if you want MP4, press this button,” but they don’t tell you what each is useful for or why you’d want one over another. If PDR were marketed to high-end video professionals, the users could be expected to have this knowledge already, but given this is aimed at the consumer, some helpful hints (or even a wizard asking what you’ll use the video for) would be nice. ColorDirector, unlike AudioDirector, will carry a custom preset back into PDR and allow you to apply it to multiple clips. As with any major piece of software, there are often multiple ways of doing something. For example, I find that splitting a clip is an easier way to trim it than the trim feature. PDR 12 has many features I haven’t used, such as the multi-cam feature, 3D, and 4K. In fact, it has so many features I’ll probably never use them all. How many stars do I give PDR 12? Well, it does frustrate me sometimes, so not five, but maybe four and a half. Okay, given the superb rendering that’s quite an improvement over PDR 11, maybe four and three quarters. To be fair, I’ll point out that CyberLink recently added me to their “Most Valued Professional” (MVP) program (see here). They approached me based on all the videos I put on YouTube. I got a cool tee shirt. There are other perks too. They specifically asked me to review PDR, and made it clear they wanted both the good and the bad. You’re reading that review. This entry was posted in Computer Tips, Product Reviews and tagged video editing. Bookmark the permalink. Yes, CyberLink has a user’s forum. Try this link, although they say they’re restructuring on April 1st. I have dozens of teaching video’s to edit I am in South Africa. Wow Dave, Very thorough, very informative. I’m researching all I can about PD12 over the weekend while awaiting my shipment from Amazon due Monday. I have used Pinnacle Studio since version 9, but have had too many problems with Studio 16 that I’m giving up and moving over to Cyberlink Power Director. I saw others had problems with PowerDirector 12 and Windows 8 and 8.1, but you said you had none with Windows 8.1. Is there a Cyberlink Forum that you can list your suggestions on, so Cyberlink sees them? Hi Bob, there are two kinds of files here. There are the project files, which are unique to the software used to create them. For example, CyberLink PowerDirector creates PDS files, which only PowerDirector can read. On the Mac, Final Cut Pro also creates its own project files. Then there are the output files—the actual rendered video. These might be AVI, MTS, MP4, M2TS, or other formats. These files play on any computer that has the right codecs. If you render an AVI file on the Mac on Final Cut Pro, you can then read that file on a PC and either play it with the appropriate video player (e.g., QuickTime), or ingest it into PowerDirector for further editing. Please note that once a video is rendered, all the editing instructions are lost—they’re only used to create the final rendered video and don’t get packaged along with that rendering. I hope that helps. Best review yet. 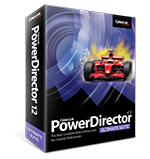 Just purchased Power Director 12 Suite. I wish I could find a location in Florida I could attend hands on training. sorry, I should have specified. I mean how do you exchange VIDEO files and edit and change a file on say a MAC and then push to to the common drive to be picked up and edited by the Windows user for further processing. I am not saying this is the normal way I operate but there could be a time where I receive a video that was created by a Windows user and the process that I need to perform is unique to some Mac application that I need to use. So, I am asking if Cyberlink’s product has the functionality capable to deal with files of various types that allow such platform duality? Hi Bob, thanks for your comments. I run PC and my wife runs Mac. We exchange files from time to time, mostly jpegs. I put them on a shared network hard drive and she picks them up there and vice versa, without trouble. Beyond that I don’t have much experience.